On July 9 ,China and Germany on Monday agreed to unequivocally oppose protectionism and safeguard free trade system based on multilateral rules to promote strong, sustainable and balanced global economic growth. 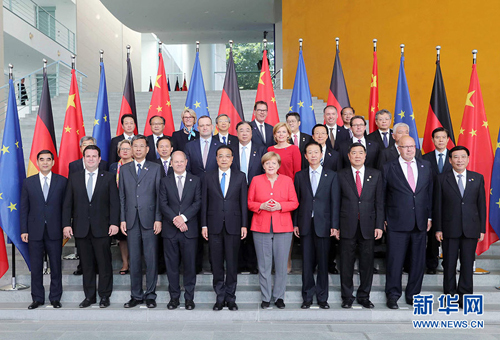 Chinese Premier Li Keqiang and German Chancellor Angela Merkel co-chaired the fifth round of intergovernmental consultations and made the announcement in Berlin. While Germany appreciates China's further measures to open its financial market, China supports the construction of Frankfurt financial center and the offshore market of renminbi. The two countries agreed to promote bilateral cooperation in economy, trade and investment, jointly safeguard free trade and an international market based on fair and recognized rules and relax market access. China is willing to discuss with the German side to jointly explore the third-party market, and Germany is willing to give full play to its advantages to work with China in Industry 4.0. The two governments agreed that they should build a cooperation platform for companies of both countries and create a more favorable business environment. China invites Germany to attend the first China International Import Expo and welcomes Germany to expand its investment in China. Beijing also encourages German companies to invest and set up factories in China's central and western regions. The two sides noted that they should go with the trend of the times, give full play to their industrial complementarities, and strengthen cooperation in emerging industries such as digitization, autonomous driving, artificial intelligence and new energy vehicle. They agreed to strengthen cooperation on scientific and technological innovation as well as cooperation on agriculture by fully taping the potential of digitization. Moreover, the two countries pledged to make joint contributions for tackling global challenges by stepping up cooperation in fields such as environmental governance, energy saving, biodiversity conservation and dealing with climate change. The two countries also agreed to expand people-to-people exchanges and deal with the issues concerning the aging of population. This round of intergovernmental consultations is the first of its kind since the two countries' new cabinets took office in March, said the Chinese premier, adding that it is of great importance to promote and make plan for the all-round cooperation between China and Germany. Noting that at this year's annual meeting of the Boao Forum for Asia, Chinese President Xi Jinping gave a firm signal that China will expand its opening to the outside world, Li said China would like to continue to share with Germany the enormous dividends brought by its new round of opening up. China treats both Chinese and foreign companies in its territory equally and will increase the protection of intellectual property rights, said Li. He also expressed his hope that German market will remain open to Chinese companies and create a friendly and fair business environment for them. Germany and China enjoy close and extensive cooperation, said the German chancellor, noting that more than 70 dialogue mechanisms between two countries fully indicate the depth and breadth of the bilateral cooperation. Under the current international situation, said Merkel, Germany is ready to work with China to strengthen openness and cooperation and send the world a firm signal that both sides will continuously safeguard multilateralism and facilitate international cooperation. Germany opposes trade wars and advocates free trade based on rules, stressed Merkel. She also noted that China and Germany will sign a memorandum of understanding on the cooperation of autopilot, which is a milestone for the two sides' cooperation in automobile industry. After the consultations, Li and Merkel jointly witnessed the signing of a series of bilateral cooperation documents in areas such as agriculture, education, health care, chemical industry, telecommunication, automobile industry as well as autopilot. Also on Monday, Li and Merkel met the press and introduced the achievements of their intergovernmental consultations. This round of intergovernmental consultations has fruitful cooperation in various fields and open up new cooperation for the future, Li said. In the process of its new round of opening-up, China will continue to optimize market environment and strengthen the protection of intellectual property rights, Li said. Li said both sides should have a more open and confident attitude to deal with technical cooperation. He also called on China and Germany use their substantial cooperation to show that they are committed to safeguarding multilateralism and free trade so as to promote their own development, as well as the recovery of world economy.